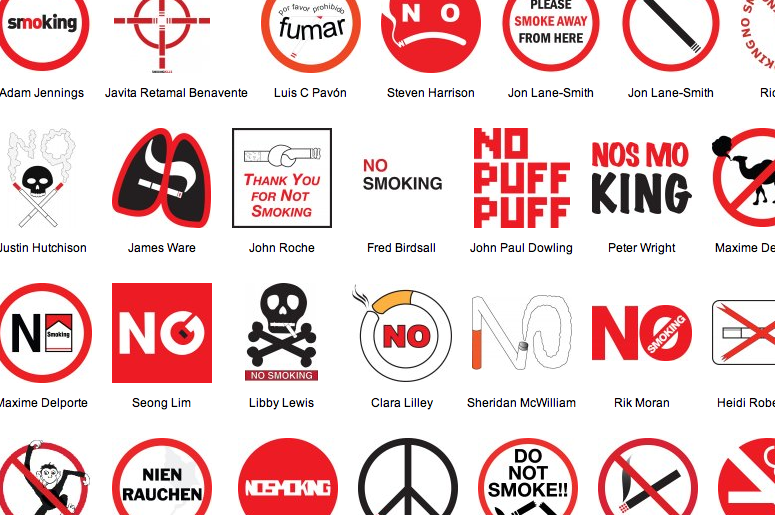 Daniel Eatock’s “No Smoking Signs” collaboration project. Chris Burns writes: The No Smoking sign is not the best example for things I need to be told not to do. But, it’s an excellent battleground for those who wish to creatively tell people to please stop killing themselves. What will happen when the message gets too clear? When will graphic design become such an exact science that it ceases to be a creative art form? Check out the film Idiocracy (2006) for a hilarious vision of the future where graphic design is perfected. This terrifying possibility proves to be one of the major reasons for the downfall of western society. Design and Advertising Teachers: are you teaching your students to do what’s best for the product, to move the most units, no matter the societal implications? Do you discuss the worldwide impact of your field in your classroom? Design or Advertising Students: What will your goal be once you’re practicing what you’ve learned? Will you attend to as broad an audience as possible? What if you have no choice? Do you believe there’s a way to continue hard-hitting design without creating such a perfectly saturated landscape that Idiocracy is achieved? Also thank you [EATOCK] for the No Smoking project. Everyone participate! This entry was posted by Chris Burns on Monday, September 1st, 2008 at 8:47 PM	and is filed under Aktuell, Free Radicals, Globalization, International, News Links, Typografika.